“A Conversation on Dance Legacy” Panel is the prelude to the unveiling of an iconic piece of dance history gifted to Keshet. Keshet Dance & Center for the Arts, 4121 Cutler Ave NE, ABQ 87110. This FREE discussion/panel is open to the public. Panelists include: Dr. Mary Anne Newhall, UNM & ADLI, Diana MacNeil, Keshet and Lewitzky Dance Company and Dr. Judith Chazin-Bennahum. 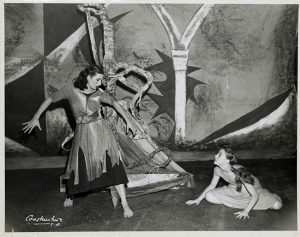 Attendees to the panel discussion will also receive a close-up living history lesson with the dedication of original set pieces from Lester Horton and Bella Lewitzky’s co-creation Warsaw Ghetto (1949), which featured dancer Bella Lewitzky. These canvas drops will now hang in the studio named for Lewitzky at Keshet Dance & Center for the Arts. Lester Horton gifted the set pieces (canvas drops) to Bella Lewitzky and they came into the care of Diana MacNeil when she purchased Bella Lewitzky’s home in Los Angeles. Diana MacNeil, part of Keshet’s Teaching Faculty since 2017, was at the dedication to tell the story behind this iconic set pieces, now residing in the Lewitzky Studio (one of five dance studios at Keshet Center for the Arts). “When I recently unraveled the canvas drops, I was reminded of the social-minded works of Lester Horton, and the execution through the exceptional Bella Lewitzky, both champions of human rights and and it felt fitting that my new home of Albuquerque, and specifically, Keshet Center for the Arts share this history,” Diana MacNeil said. The dance piece, Warsaw Ghetto was last performed in 1950 and because Lester Horton did not notate his process or choreography it was never re-mounted or duplicated. Diana MacNeil is a choreographer and teacher dedicated to the movement arts. Her work over the last four decades has included initiating roles at the Idyllwild School of Music and the Arts and the Lewitzky Dance Company. The Los Angeles Chamber Orchestra, Loyola Marymount University, Occidental College, The Cerritos Center for the Arts and the Yorke Dance Project, among others, have commissioned her choreography and her credits include educational projects from elementary to post-graduate levels at home and abroad. She founded the PostHouse Dance Group in Los Angeles which has performed to critical acclaim. In 2017, Diana relocated to Albuquerque to further her work with Keshet Dance & Center for the Arts. Established in 1996, Keshet’s mission is to inspire and unite community by fostering unlimited possibilities through dance, mentorship and a creative space for the arts. In 2013, the Keshet Center for the Arts was created as a home base for Keshet’s production season and as a resource for Keshet’s national and global performing arts partnerships; a welcoming space to house Keshet’s community education and engagement programming; and the central location for the Keshet Ideas and Innovation Community (KIIC), a business incubator and resource center for arts entrepreneurs.